Matson Line's Maui was a product of Union Iron Works of San Francisco. She was one of a series of Matson combination passenger-cargo ships with their engines and funnels aft, producing a disticntive profile which is clearly seen on this page. 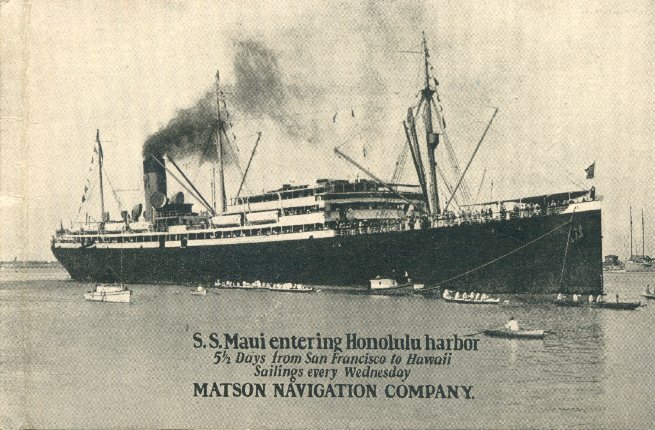 Maui made her maiden voyage, from San Francisco to Honolulu on 7 April 1917. She served as a troopship during both World Wars, and was chartered by the Panama Pacific Line in 1938 for intercoastal cargo-carrying service. She was brokn up in 1946.